If you have ever thought about a applying for a loan with sub-standard credit or have a job that is not the typical type that lenders are looking for, then you will need to have the ability to calculate this type of mortgage. The credit impairment calculator is just the tool you need. The formula can be involved but is well worth using. It may be that your can afford a loan. 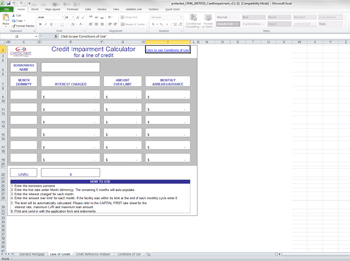 We have a free template for Excel that allows you to simply enter values into the cells. The spreadsheet will automatically calculate the numbers you are looking for. This type of credit impairment calculator can help you determine whether this type of mortgage is going to fit with your finances.